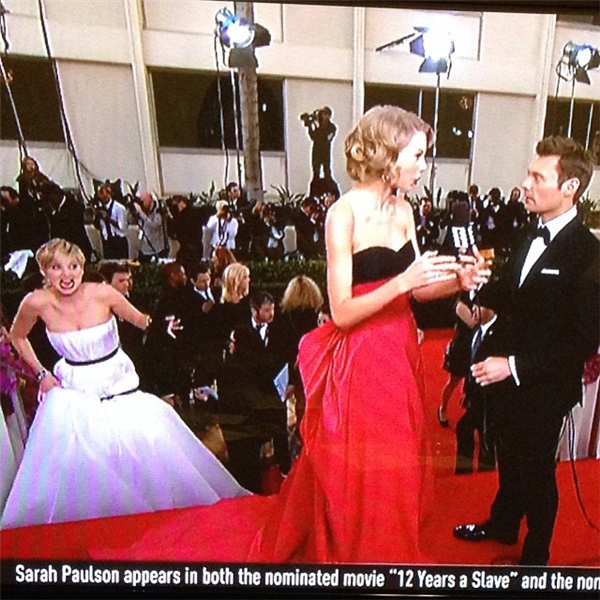 Photobombing a fellow famous celebrity is commonplace at awards shows these days, but - as usual - Jennifer Lawrence found a way to make the trend her own. The actress, who won the Golden Globe for best supporting actress in a movie that night, arrived on the red carpet following Taylor Swift. The Internet respects a pro photobomber, and there's now a #lawrencing trend thanks to her impromptu moment. The key to #lawrencing is not just surreptitiously entering the frame but doing so while wearing both a menacing snarl and a white dress that looks like it's been haphazardly secured with black duct tape. A: people who say things like "#lawrencing"
This looks like last years Oscar gown with the addition of a couple of automotive fan belts. That looks needs to be returned to the ugly shop.